Stardust Vanguards is a high-speed local multiplayer combat game available digitally for PlayStation 4. Player battle it out with a sword and gun, as they summon reinforcements to help them in battle. Player's will also have to contend with random events that occur throughout each battle, pitting computer-controlled space pirates against the players, and these NPC pirates can also win the battle for themselves. Stardust Vanguards is a local four-player battler, where players take the role of military commanders in high-speed combat robots, engaging in heated, high-precision multiplayer dueling. Carefully hone your skills against your enemies as you slice 'em up, shoot 'em down, and even reflect incoming bullets with your attacks. Each battle becomes deceptively strategic as each player earns and summons their own personal NPC army to help them win each battle. The centerpiece of the game's combat is its reinforcement system. As you survive and kill off enemies, you'll earn RP (“reinforcement points”), which can be used to summon reinforcements into battle. The more RP you have, the bigger and badder your allies will be when you call them into battle. You can fight alongside these NPC reinforcements or hang back while they do the heavy lifting for you. The game also includes a random event system which keeps each fight unique as computer-controlled space pirates sweep in to win the battle for themselves in dozens of predetermined assault scenarios. Will you briefly cooperate with your friends or will you use the chaos to your own advantage? 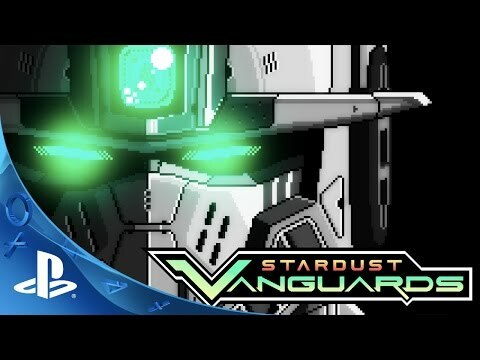 Stardust Vanguards brings high-speed mecha action to fans of couch multiplayer!